Lokmat Marathi language newspaper in India. It is the fifth largest Indian daily & in Marathi, it is the largest selling daily with 15.8 million copies a day. publicnoticeads.com is Advertising agency accepting the all types of advertisement in Public Notice advertisement in Lokmat Newspaper. Get Special packages & Discounted ad rates for Public Notice. Get your public notice Publish in Classified & Display of Lokmat Newspaper. publicnoticeads.com book all types of Public Notice Advertisements for the below sub-Categories for Lokmat Newspaper. 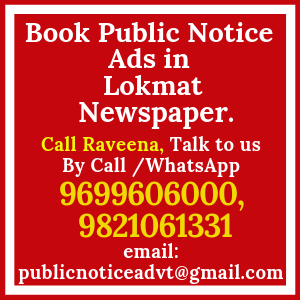 Below get the advertisement rates with editions for Lokmat Public Notice ads.